Home > Traditions and History > What is the Significance of Advent? It can sometimes be easy to forget in the midst of all the merry festivities, funny customs and commercial broohaha, but Christmas is ultimately a religious holiday, celebrating the birth of Jesus Christ, the son of God, born from the Virgin Mary over 2000 years ago in the small town of Bethlehem. That is exactly why Advent exists: as a way of making Christians focus on the essence of Christmas again, preparing for the religious festival as much as the fun and present giving. The word is derived from the Latin "Adventus", which literally means "The Coming" - obviously referring to Christ "The Saviour". Advent is a period of prayer, teaching and storytelling that goes on for a few weeks: in the Western Christian traditions it starts on the fourth Sunday before Christmas, but in the Eastern Christian traditions it can last as long as forty days. The first historical record of Advent can be found in a canon of the Saragossa council from 380 AD, which obliged Christians to come to church between December 17th and December 24th - or rather, forbade them from not doing so. It is mentioned again in 524 AD - this time officially, impacting everyone anywhere who calls themselves Christian - in the Synod of Lerida. The start of Advent is also considered as the beginning of the religious year for Christian churches, at least those from the Western tradition. Churches from the Eastern Christian tradition begin their church year on the 1st of September. During Advent, a lot of the church readings and stories told are about the Second Coming: the focus is most definitely on tying together the celebrations of the birth of Christ with the anticipation for his return to Earth - from Baby Jesus to Christ the King. With this Second Coming in mind, Christians repent for their sins, reaffirm their faith and hope they will be granted access to Heaven - and thus eternal life. The church services on the four Sundays of Advent come with a fair bit of tradition: there's no deviating from the liturgical colours, for example. The first two Sundays only purple is to be used, as it is the colour of penitence (it is also the colour of suffering and therefore used in the Holy Week, thus creating an interesting liturgical connection between the birth and death of Christ). On the third Sunday the liturgical colour changes to pink: after all the penitence, it is time again for celebration. 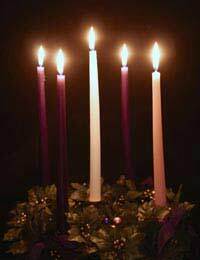 Christians will of course be familiar with Advent, but even non-believers or those who belong to different churches will at least know the Advent wreath: the rings of evergreen with four candles. Every Sunday, one of the candles is lit in honour of Jesus Christ, until all four of them are burning. The lighting of the candles is accompanied by readings from the Bible. Sometimes an extra candle is placed in the middle of the wreath, and that one is then lit on Christmas Eve - reminding us that Jesus is the light of the world.